SpaceX announced on Wednesday that it is planning to launch its robotic Dragon capsule to Mars as soon as in 2018. Given that the commercial spaceflight firm wants to establish a colony on the red planet, the announcement on Twitter said the Red Dragon mission would provide information about the overall Mars architecture. 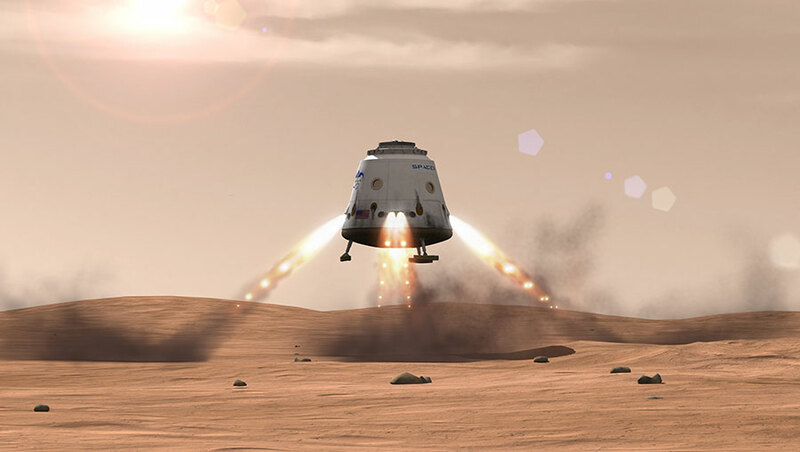 The first test flight of a Dragon capsule to the Red Planet would prove technologies required to land large payloads on Mars, a source familiar with SpaceX’s plans told Space.com. The Red Dragon spacecraft measures roughly 20 feet tall and 12 feet wide, SpaceX said. Founder Elon Musk tweeted that Dragon 2’s design allows the capsule to land anywhere in the solar system and confirmed Red Dragon Mars mission was the first test flight, but warned that it wouldn’t be a good idea to carry astronauts beyond Earth-moon region. He said it wouldn’t be an enjoyable experience to fly on the space capsule for longer journeys. The company’s plans to send humans to Mars are expected to be released in September at the 67th International Astronautical Congress in Guadalajara, Mexico. Musk said during a Reddit “Ask Me Anything” session held in January 2015 that the company would release details of the “Mars Colonial Transporter” by the end of that year, but no one has heard of them yet. That would be the spaceflight system that would carry humans to and from the Red Planet. The company is now developing a rocket named the Falcon Heavy, which is supposed to be able to carry astronauts and cargo to deep-space destinations, including Mars, SpaceX said. Musk’s firm on April 8 successfully landed the first stage of its Falcon 9 reusable rocket on a drone ship, which represents a huge step towards making a Mars colonization more economically plausible. As for NASA, it has also announced plans to send astronauts to Mars in the 2030s but details haven’t been released yet. The space agency selected SpaceX alongside Orbital ATK to carry cargo to the International Space Station, in addition to the Sierra Nevada Corp. NASA selected Musk’s company and Boeing to fly astronauts to the orbiting laboratory, hoping that those flights would begin as soon as next year. The Red Dragon mission will count on NASA’s technical assistance and communications and navigation support, according to an agreement signed by SpaceX and NASA, which is the only space agency that has successfully landed a spacecraft on Mars and obtained science data.